Summer’s great and all, but fall’s got a whole lot going for it: Sweater weather, jack-o’-lanterns, and pumpkin spice up to your ears. Oh, yeah — and lots (and lots, and lots of beer). The sun’s setting on September, which means all sorts of fall festivities are upon us, perhaps the best-known of which is Oktoberfest. Originally started all the way back in the 1800s in Munich, this October festival has been going steady every year since, complete with a flagon-sized helping of pretzels, beer, and merriment. You can even travel to Munich to partake in this once-in-a-lifetime event, which draws more than six million visitors to the country every year. But if a trans-Atlantic flight isn’t in the cards for you this autumn, don’t worry: we know how to throw an excellent German beer festival right here in America! 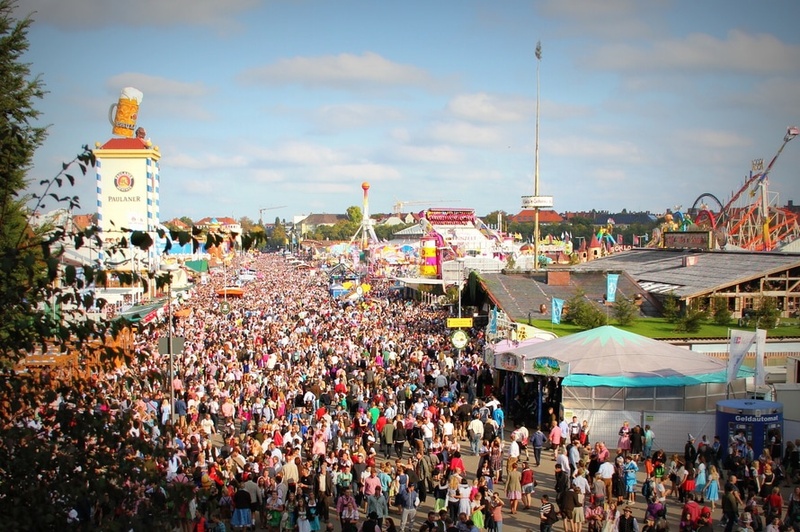 Known by German natives as the Wiesn, Oktoberfest is the largest fall festival not just in Europe, but in the world. And here’s a fun fact: It all started as a humdinger of a wedding party! Back in 1810, Prince Ludwig — later King Ludwig I — got hitched to Princess Therese of Saxe-Hildburghausen on the lovely fall day of October 12. And being gracious hosts, they invited all of the citizens of Munich to come out and join the celebration in front of the city gates. This first Oktoberfest celebration drew tens of thousands of visitors, who descended on the fairgrounds for food, music, and even horse races — and, of course, plenty of delicious German beer. Over the years, the festival evolved; carnival booths and feats of strength were added to the frivolity. Celebrants tried their hands (and legs) at tree climbing and bowling as well as the customary horse racing, and local farmers brought out their very best specimens for an agricultural show. Better question: Where isn’t Oktoberfest? 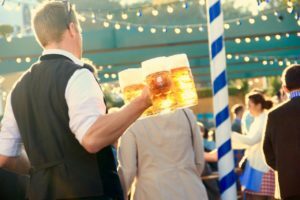 Even if it’s not in your schedule or budget to visit the original festival in Germany, chances are there’s an epic Oktoberfest celebration close to you — or in a location that’s more easily accessible by RV travel. Thanks to the storied lineage of German immigrants in the United States, these Bavarian blowouts occur across our country every October, complete with all the same authentic, delicious treats you’d find at the source. 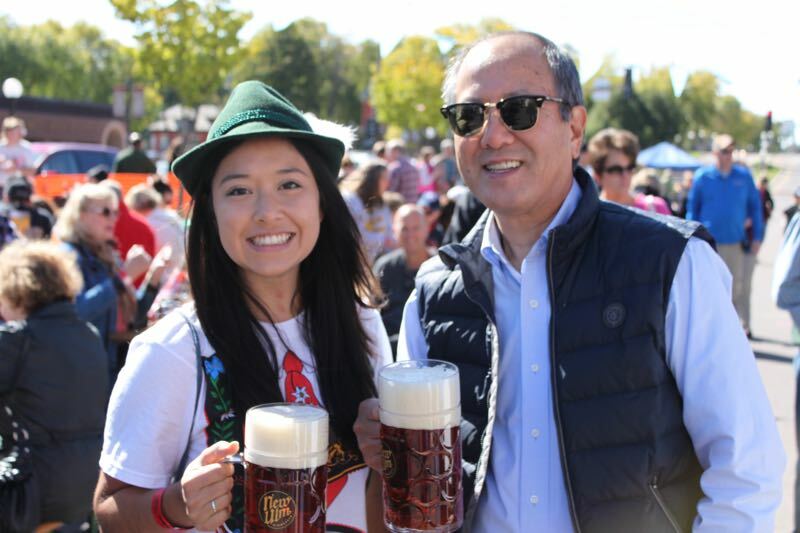 Of course, some American communities have a denser population of German-heritage citizens than others, and some simply pour more time and resources into making their Oktoberfests the very best they can be. A few American Oktoberfest celebrations come close to matching their inspiration in terms of both size and festive spirit! If you’re looking for a domestic answer to the world’s largest international celebration of beer, pretzels, and all things Bavaria, set your GPS’s sights on the following U.S. cities. Proclaiming itself America’s largest, Oktoberfest Zininnati has been an Ohio tradition since 1976, drawing over half a million people each year. What else to see and do while you’re in Cincinnati: In case you somehow still have an appetite for brews and eats after the festival, you can take advantage of one of this town’s many walking food and beverage tours. Otherwise, pay a visit to one of its many parks and cultural attractions; the Cincinnati Art Museum is very highly regarded. Where to camp in Cincinnati: Hidden Valley RV offers both long-term storage and year-round camping just minutes from the city center. The Mile High City may get more press for its devotion to a different kind of intoxicant these days — but they still know how to throw a killer beer festival. In fact, Denver’s Oktoberfest has been named the best in America by both USA Today and Maxim. No surprise, either: the event is totally free to enter, though you obviously have to pay for the food and beverages you’ll inevitably consume (in quantity) while you’re there. The organizers offer a unique commemorative stein each year, which is a great deal if you’re planning to drink more than just one beer — which who isn’t? What else to see and do while you’re in Denver: This goes without saying, but go to the mountains! Rocky Mountain National Park is right next door, as well as a host of smaller state parks with lower costs of entry. October brings perfect hiking weather if you prepare properly; a few moisture-wicking layers, and that crisp chill means hours of sweat-free exploration. Where to camp in Denver: You can definitely find plenty of camping options in the wildernesses nearby this mountain town. But you can also stay right in the thick of things at privately-owned campgrounds, like the Flying Saucer RV Park or the South Park Mobile Home Community. Not only is this one of the best-known Oktoberfest celebrations in Texas — it’s also one of the most easily accessible. Located smack-dab between Austin and San Antonio, you can get to Fredericksburg’s Oktoberfest within a couple hours’ drive from either metro. Along with the requisite booze and food, Fredericksburg also offers a wide range of live entertainment… including some you perform yourself. For instance, you and your family can participate in the annual Hauptstrasse Chicken Dance. Just keep in mind it takes place at 9:30 on Saturday morning, which might be a bit early depending on how hard you partied on Friday. What else to see and do while you’re in Fredericksburg: Yes, Oktoberfest is about beer… but Texas Hill Country is well-known for its wine production. So if you’ve saved some room in your budget (and liver), don’t miss out on tasting some of the local vino. 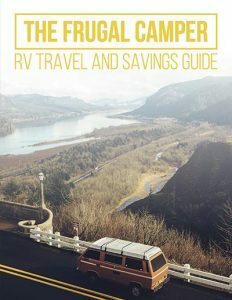 Where to camp in Fredericksburg: Fredericksburg RV Park is right in the heart of town, and Lady Bird Johnson Municipal Park offers camping just a few miles away. 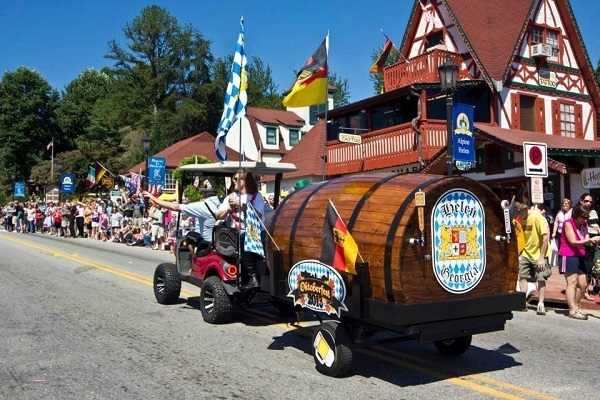 Held annually at the town’s Festhalle for almost half a century, Helen, Georgia’s Oktoberfest combines southern charm with authentic German party spirit. Enjoy beer, brats, and — best of all — live bands performing authentic Bavarian music. There’s also a parade, and the event’s beer garden is dog friendly! What else to see and do while you’re in Helen: In this north Georgia wonderland, it’s all about getting outside. Even though it’s a little too chilly to take a dip, it’s still worth the hike to see nearby Dukes Creek or Anna Ruby Falls; the forested trails alone will leave you smiling. Where to camp in Helen: Situated right alongside Smithgall Woods State Park, there’s plenty of public camping near this little Georgia burg — and resort-style parks, too. 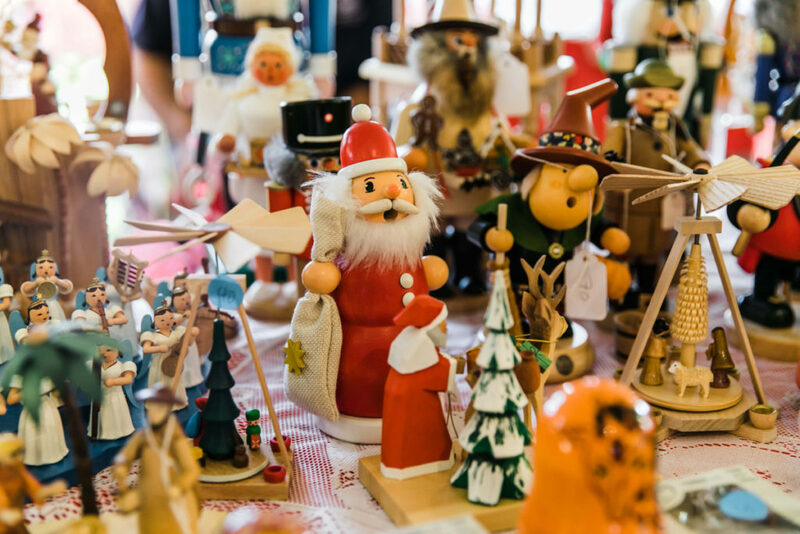 This bustling midwestern village, filled to the brim with restaurants and quaint shops, pulls out all the stops for everyone’s favorite fall festival. 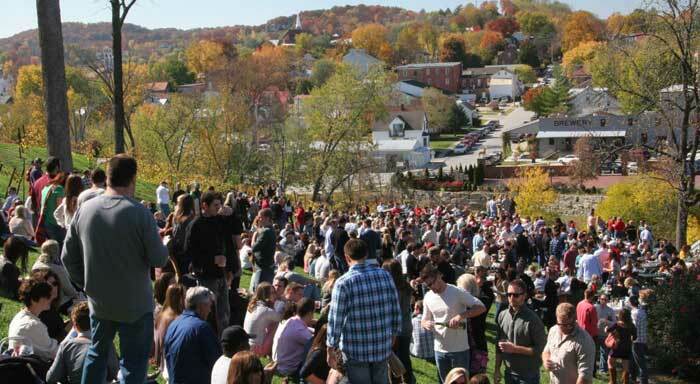 Hermann’s Oktoberfest takes place over all four October weekends — and thanks to the region’s winemaking legacy, oenophiles will have just as many options as beer-drinkers. Check out the events page at Hermann’s travel bureau website for the full rundown on all the fun taking place, including lots of live music and interactive events. This year, there’s even a ghost hunt planned at the town’s historic theater! What else to see and do while you’re in Hermann: This part of Missouri is known for its wine production, so try to pace yourself enough to partake of a bit of the vine. Otherwise, a trip into St. Louis might be in order; take the trolley car ride to the top of the Arch and wave down to the freighters on the Mississippi! Where to camp in Hermann: Hermann City Park offers full hookups, as do nearby Lazy Day Campground and Kan-Do Kampground. 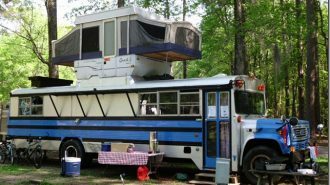 Click here to see RVshare rentals near Hermann, Missouri. According to La Crosse, Wisconsin, their Oktoberfest is “das beste” — and given the state’s Germanic heritage (an abundance of cheese and beer), we wouldn’t be surprised. What else to see and do while you’re in La Crosse: Riverside Park is well worth a stroll, even in the chilly weather. Need to warm up? Head to the Franciscan Sisters of Perpetual Adoration Motherhouse — one of the most beautiful churches in the country. 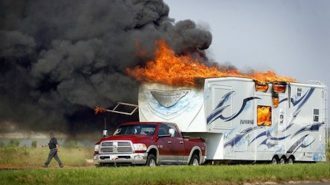 Where to camp in La Crosse: Bluebird Springs Campground offers full hookups with up to 50 amps of power, or you could get extra cushy at the Pettibone Resort. Click here to see RVshare rentals near La Crosse, Wisconsin. 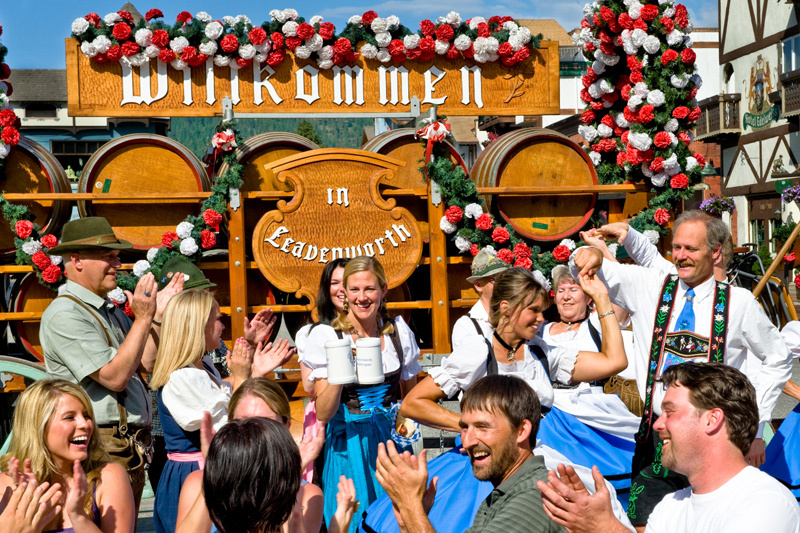 Leavenworth, Washington calls their Oktoberfest celebration “the next best thing to Munich” — and given that the town sports a Bavarian theme year-round, that might just be the case. It may be a small town, but it puts on a big hoopla for its most appropriate yearly celebration, featuring not one or two but four venues, each filled with food, beer, and live music. Tickets start at $10 and go up to $20 depending on which day you’d like to attend, but children under 12 get into the event for free. Active and retired military members also earn free admission when they show a valid ID, as do their immediate family members. What else to see and do while you’re in Leavenworth: From parks and spas to guided tours and wineries, there’s plenty to see in this Bavarian-themed gem of a town. Check out its official website for the scoop. Where to camp in Leavenworth: Leavenworth is surrounded by campable woods, but there’s also a KOA as well as a few other resort-style campgrounds in the area. Music City might be better known for banjos than accordions, but that doesn’t mean they don’t know how to put on one heck of a beer fest. Nashville’s Oktoberfest has been going strong for almost 40 years now, and includes seven draft beer stations as part of its totally-free general admission. Pretty sweet, right? 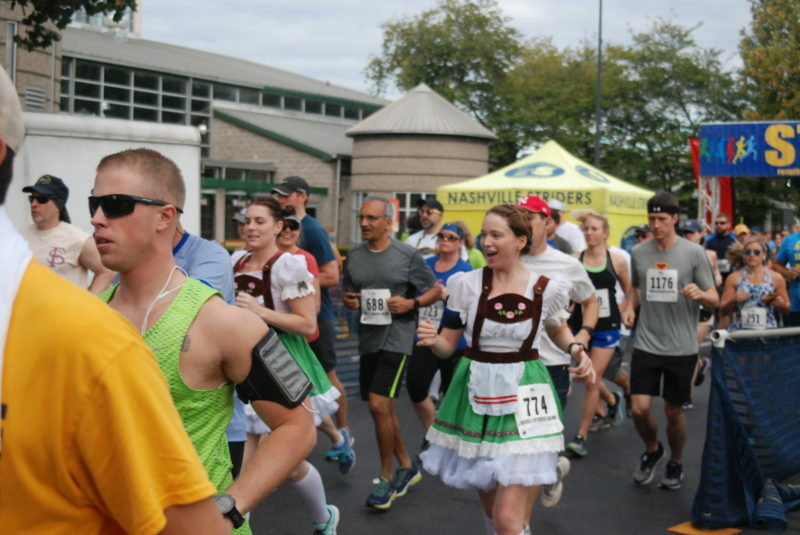 And if you’re looking for a way to work off all those mustard-covered pretzels, you can partake in the annual 5K bier run. Finishers get — you guessed it — a 20-ounce Oktoberfest beer to celebrate their athletic accomplishment. 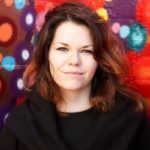 What else to see and do while you’re in Nashville: Once you’re sick of polka, head out into the Nashville streets to hear a multiplicity of other musical stylings. If you’re even a small fan of country, a visit to the Grand Ole Opry is definitely in order. Where to camp in Nashville: Music City is home to both a KOA and a Jellystone Park, as well as the public lakeside campground at Anderson Road. Can’t get all the way to Germany — but you might be able to make it to Minnesota, eh? If so, you’re in luck. New Ulm’s Oktoberfest is one for the books, including live polka, delicious brews, and family-friendly activities like horse-drawn trolley rides. What else to see and do while you’re in New Ulm: From the Milford Monument to the Kiesling House, there’s no shortage of historical landmarks and points of interest to check off your list while you’re in this Minnesota town. And, of course, your trip wouldn’t be complete without seeing Hermann the German — especially during Oktoberfest time! Where to camp in New Ulm: Flandrau State Park offers electric hookups and has all kinds of conveniences on-site, like a gift shop and a restaurant. Click here to see RVshare rentals near New Ulm, Minnesota. 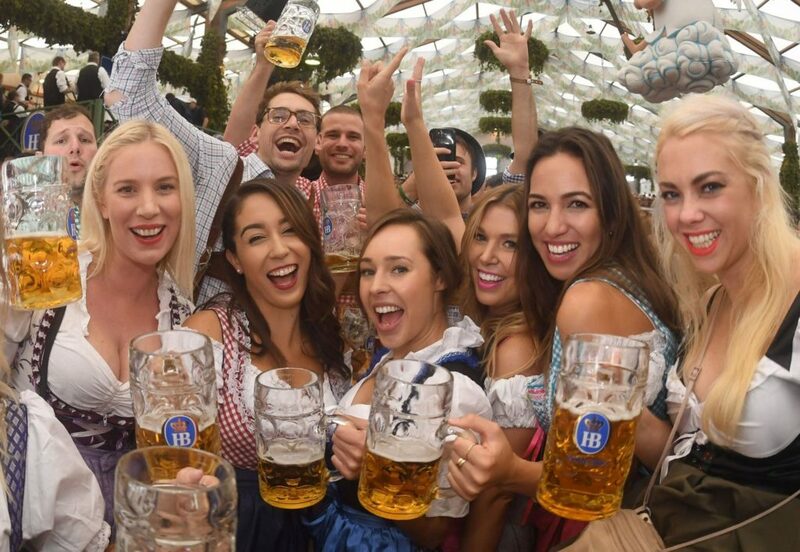 It’s no surprise that one of the most densely-populated cities in the country puts on an all-out bender for this Bavarian bash. Taking place over one late September weekend, San Francisco’s Oktoberfest celebration draws merry-makers from across the Bay Area and beyond. Music and merriment take place Friday and Saturday until midnight, as well as Sunday during the day. Tickets are available for pre-purchase on the event website. What else to see and do while you’re in San Francisco: … I mean, it’s San Francisco. What isn’t there to do? High on our list of Bay Area attractions: a stroll along Haight-Ashbury, squawking sea lions and dessert at the original Ghirardelli location. There are also endless museums, eateries, shops, and parks. Where to camp in San Francisco: It may be one of the most densely-populated metropoles in America, but there are still places to camp in the big city by the bay. Check out San Francisco RV Resort for starters. 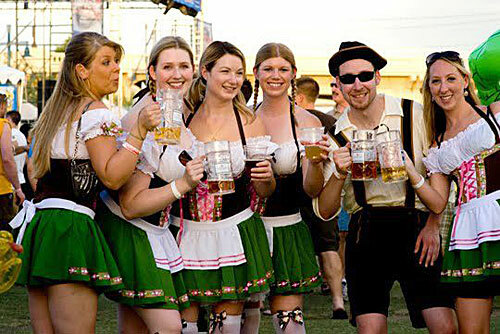 Hosted and sponsored by Arizona’s Four Peaks Brewing Company, Tempe, Arizona’s Oktoberfest takes place annually at Tempe Town Lake. Chow down on freshly-made brats while enjoying traditional Bavarian music at one of the three stages — all the entertainment is live and totally free. 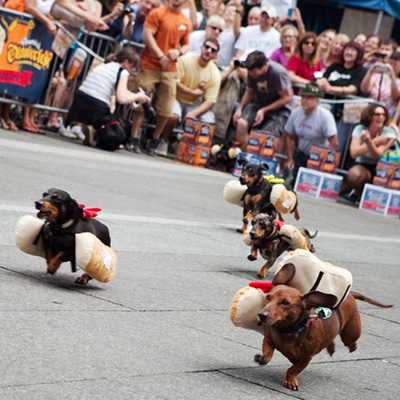 Perhaps the best part of Arizona’s answer to Munich’s madness: Sunday Funday, which includes a boozy brunch, wine tastings, a Cardinals viewing party, beer samplings, and a dachshund race. What else to see and do while you’re in Tempe: It sometimes feels like if you’ve been to one arboretum, you’ve been to all of them — but the Desert Botanical Garden truly is a totally unique experience. Phoenix also has a world-class zoo as well as multiple parks and museums to explore. Where to camp in Tempe: Apache Palms and Green Acres are right in town, and there are plenty of other options in the nearby Tonto National Forest. 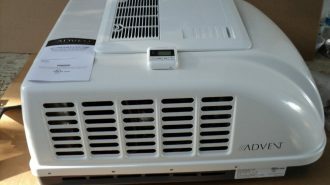 Click here to see RVshare rentals near Tempe, Arizona. You might be surprised at just how much authentic German bier and food you can find in America’s heartland — yes, even in the grassy plains of Tulsa, Oklahoma. And the music is unparalleled; each year, several bands travel from Germany to perform at the event! General admission tickets are $7 in advance or $10 at the gate, though there are also several upgraded VIP options available. Check out the official Tulsa Oktoberfest website for full details. What else to see and do while you’re in Tulsa: This Oklahoma town is way more than just OK, with tons of activities to choose from for the whole family. Take the kids on a trip to the zoo or the aquarium, or satisfy your own cultural curiosities at the Tulsa Art Deco Museum. Where to camp in Tulsa: There are plenty of privately-owned campgrounds to choose from right in Tulsa, including Tulsa Warrior RV Park, Canyon Creek Campground, and Mingo RV Park. There’s also a low-cost public park option at Lake Sahoma. Click here to see RVshare rentals near Tulsa, Oklahoma. 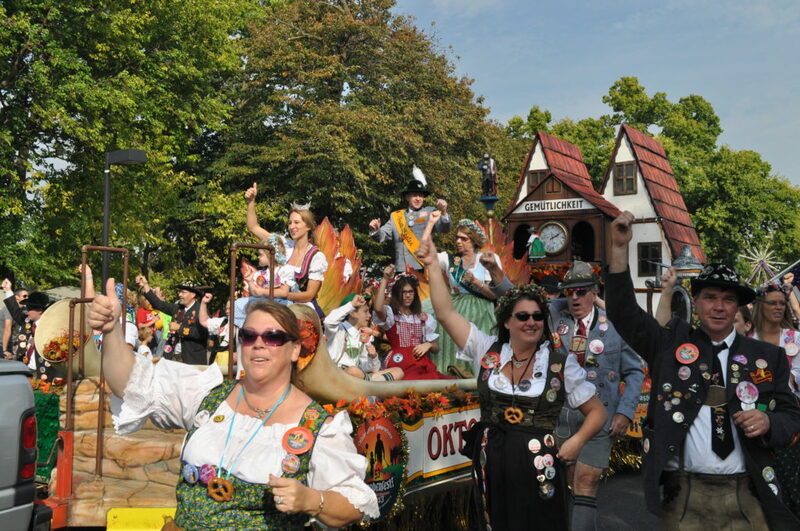 Although the original Oktoberfest took place (and continues to take place) in mid-October, some of the spinoff celebrations happen earlier or later. It’s always important to double check the specific dates and hours before you purchase your Oktoberfest tickets. 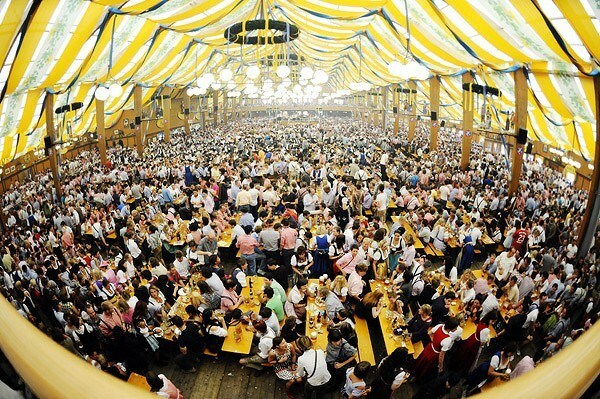 Which brings up another important consideration: How much, exactly, does Oktoberfest cost? What’s the only thing better than a killer Oktoberfest party? A whole Oktoberfest vacation, of course! Although the popularity of this event means there’s likely an Oktoberfest celebration to catch in your immediate area, it’s fun to turn the event into a journey. Any of the above destinations make excellent Oktoberfest trips. Not only do they have legendary parties, but they’ve got tons of other things to see and do while you’re in town. You could also consider creating a totally unrelated itinerary — a fall tour of America’s national parks, for instance — and then look and see what Oktoberfest goings-on are happening in the vicinity after you have your schedule planned. 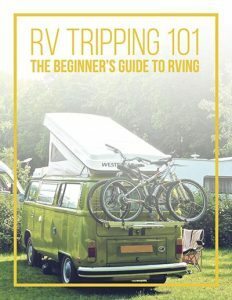 Summer is probably the season most readily associate with RV camping. But fall camping is awesome, too — and yes, it’s even possible to use your travel trailer or motorhome in the dead of winter! 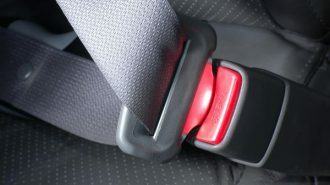 Of course, there are a few extra considerations to keep in mind and preparations to make when you’re headed out into the wilderness in the colder weather. For one thing, you want to be sure to pack plenty of warm layers, preferably made of moisture-wicking fabric. That way, you can easily put on or shed garments to keep up with autumn’s somewhat-bipolar, widely-swinging weather — and you won’t have to worry about being stuck in a damp, chilly shirt when you inevitably sweat! 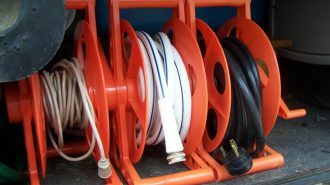 We’ve written before about RV camping during the off season, including this helpful guide on how to pack for fall camping trips, as well as posts about winterizing your RV and surviving while driving through sub-freezing temperatures. 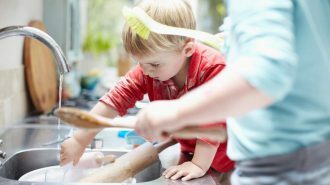 We’ve even tackled celebrating the holidays in your RV, including making meals and entertaining a large crowd in teeny-tiny spaces— and how to stave off (or fight through) bouts of holiday illness. We want to ensure your Oktoberfest camping trip is as fun and safe as possible, so be sure to check back on the blog (or scroll through our existing information) for even more helpful hints and tricks. You can also always tag us on social media or reach out to our customer service team directly — we’re eager to answer your questions and help make your dream trip a reality! 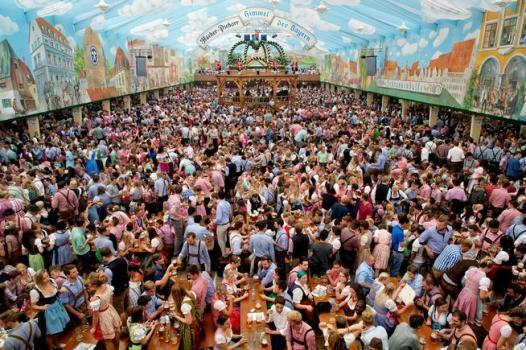 Ready to Take on Oktoberfest Travel? Even if none of the above-mentioned destinations are in the cards for you this fall, there’s doubtless something fun and booze-fueled happening in your area this October. Run a quick search for “Oktoberfest near me” to see what’s going on close to home, or check out our post on other fall festivals and events if you’re not much of a beer drinker. From picking apples to carving pumpkins, there are all sorts of ways to celebrate the harvest season, even if you’re a teetotaler. 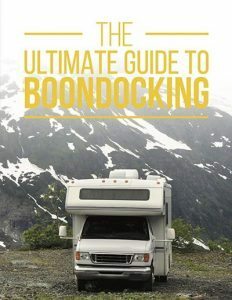 Finally, keep in mind that renting an RV is one of the most convenient and flexible ways to visit any destination, any time of the year. And when you rent through the peer-to-peer market at RVshare, you get the chance to experience a real vehicle owned by a real person — as opposed to a totally-vanilla, off-the-lot version you’d get at a big box store. No matter where you’re headed this fall or what kind of mischief you’ll get into once you get there, we wish you all the best for a plentiful and celebratory harvest season — and a warm and merry winter to come.